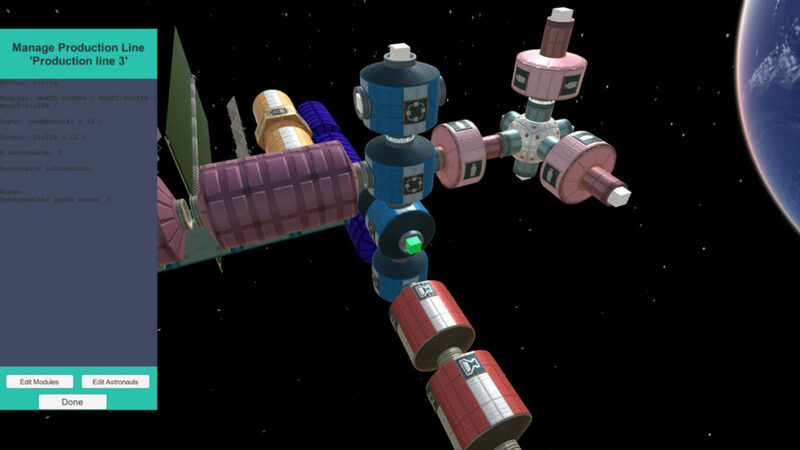 The installation of production modules in order to manufacture commercial goods such as ceramics, crystals and fiber optics is one of the core mechanics behind Space Station Inc.. These commercial goods are then dispatched down to Earth via resupply vehicles and can be sold in the market in order to generate the income required to keep the company’s funds positive. Players can also group adjacent modules together under the same Production Line. 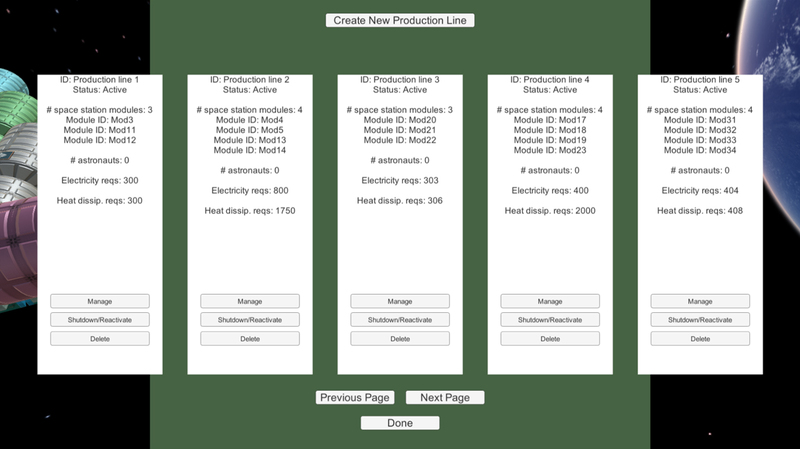 Originally, the implementation of the production lines management functionality was spread across various screens, following the designed devised during the pre-production phase. 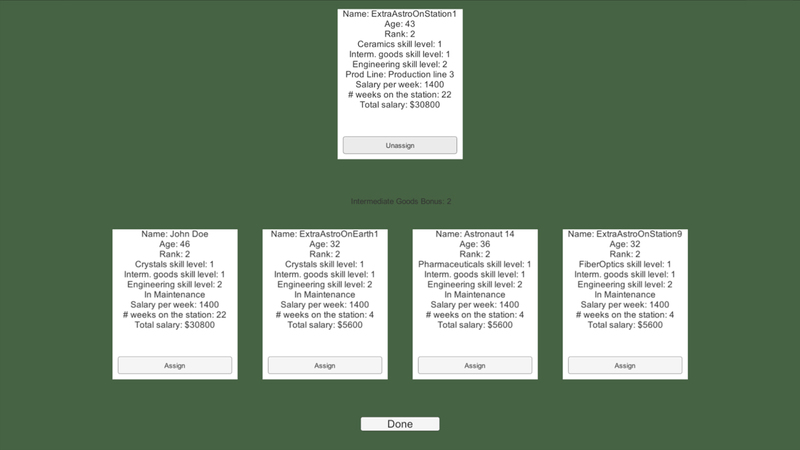 Once we started working on the final implementation of the user interface for ‘flat’ platforms, Mauricio revisited the implementation and realised it could all be streamlined under a single screen. In this blog post, we are going to narrate the journey that started with the initial mock-up layouts and ended with the final implementation that encompasses all the required functionality under a single screen. 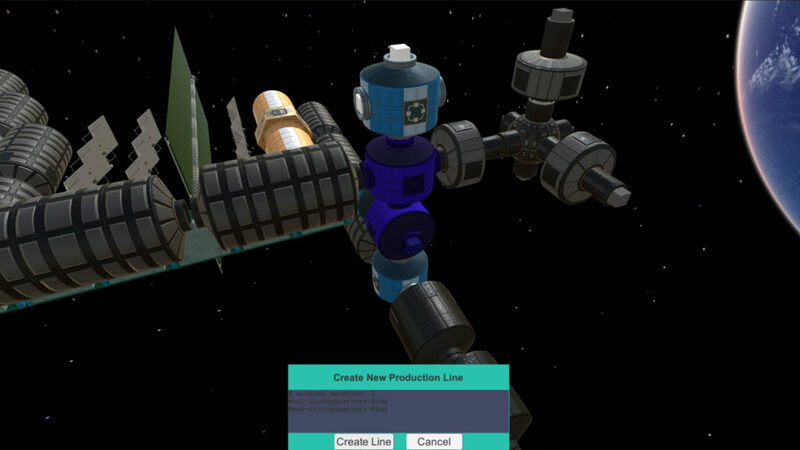 Initial mock-up screen depicting the main production lines screen. Initial mock-up diagram depicting the production lines management screen. 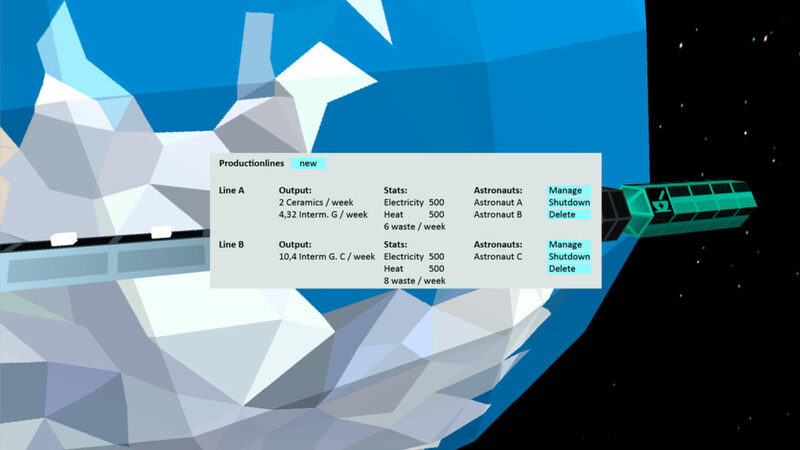 Initial implementation of the main production lines screen. 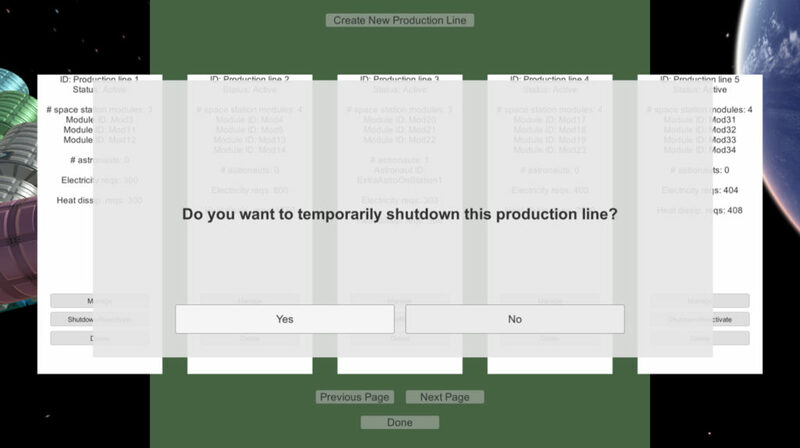 By selecting the Shutdown/Reactivate button, a specific production line can be temporarily shut down. This can be useful in situations where there are not enough available astronauts on the station to perform maintenance duties or when an electricity generation module breaks down and the station’s energy requirements cannot be met anymore. Confirmation message for shutting down a production line. Starting the creation process of a new production line. 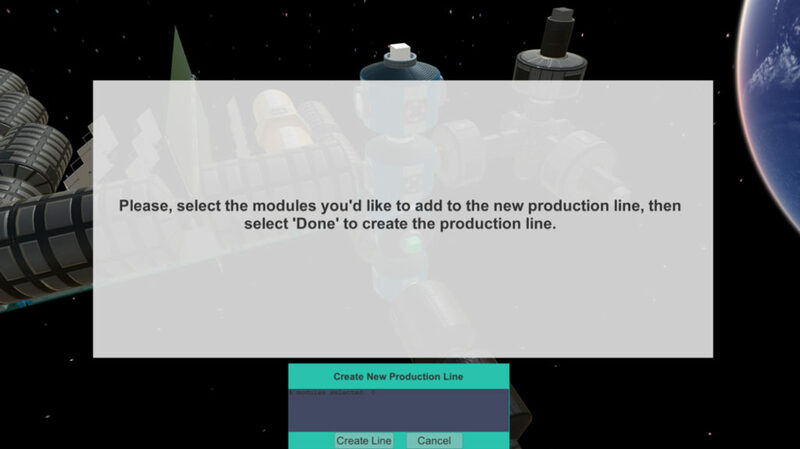 All modules can potentially be added to the new production line, provided that they don’t belong to an existing production line and that they are adjacent to another module from the production line being created. Alternatively, a module can be removed from the new production line, provided that it doesn’t break the path between any two given modules. All added modules pulsate with a blue colour and get added to a list at the bottom of the screen. The creation process concludes by pressing the Create Line button. Creating a new production line. Selecting the Manage button for a given production line opens up a screen with information and displays its modules using a pulsating blue material. By selecting the Edit Modules button, modules can be added and removed. The same rules from the creation process apply, though: the resulting production line needs to be an uninterrupted list of modules. Adding and removing modules from a production line. Adding and removing astronauts from a production line. 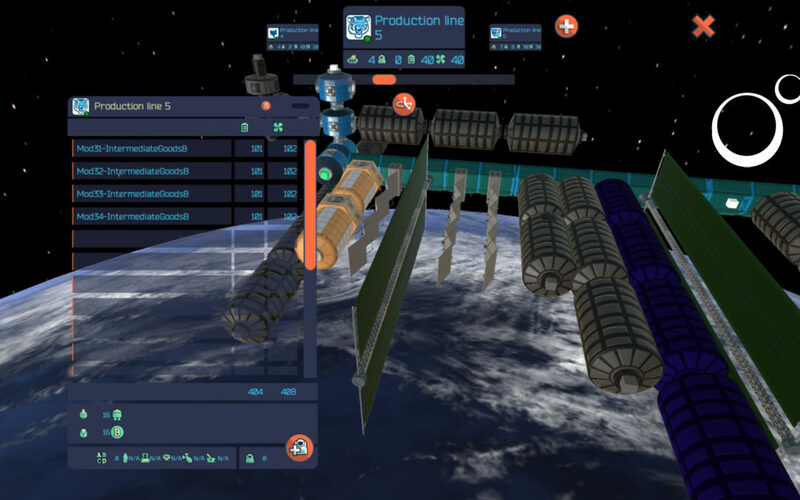 The gameplay prototype provided enough functionality in order to playtest the game mechanics related to production lines. That being said, when we revisited all these screens in order to write the final implementation of the ‘flat’ version, Mauricio realised that there was no need to have this functionality spread out across several screens and that we could adopt a more streamlined approach instead. The result of this redesign is the topic of this sub-section. The new production lines management screen has a scroll list at the top where players can navigate through existing production lines. While browsing through them, the list of modules located in the left panel gets updated accordingly. Browsing through the list of existing production lines. 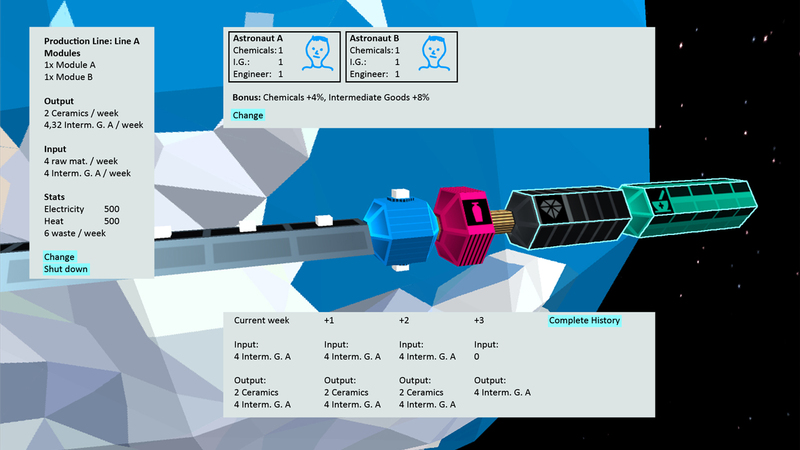 By pressing the Astronaut button located at the bottom of the left panel, the list of modules in the left hand side gets replaced by the list of astronauts currently assigned to the production line. This also brings a list of all available astronauts in the right hand side of the screen. Astronauts can be assigned and removed by using the drag and drop mechanism discussed in our previous blog post. Switching from the modules list to the astronauts list. Switching back from the astronauts list to the modules list. Confirmation dialog for deleting an existing production line. The screen for starting the creation process of a new production line. The process of adding and removing modules to the production line.